Polyurethane foam insulation has attracted considerable attention in recent years as a green, affordable, and highly effective building material. This material is mixed on site and blown into (and onto) the walls, roof, and other supports of a structure to apply an even insulation surface and create a tight seal. Its design allows it to be spread into even the smallest cracks, and as it expands and hardens, it creates a tight, water-resistant seal that provides a very high insulation value, useful for cold regions like Denver where heating and cooling prices add up, all at a very affordable price. Sounds like a green building dream, right? Spray foam insulation has been used in the construction of a number of buildings that meet incredibly high green building certification standards and the industry touts how environmentally-friendly this product is, but is it? And how healthy is it for people who work with it, as well as those who work and live in buildings with spray foam insulation? While it was initially believed to be quite safe, the evidence on that is changing. Here's how it works: two mixtures, known as Side A and Side B, are sprayed on site by trained installation personnel. Before the mixtures combine and cure, they contain a number of compounds known to be hazardous to human health, which is why anyone on the premises needs to wear appropriate protective gear, including solvent-resistant gloves, a respirator, and a suit. Homeowners and others should be kept off the site if possible, and if they must be there, they need protection. For anywhere between seven hours and three days, depending on manufacturer recommendations, people should not be in the area without protection. This time allows the product to fully finish curing and expanding, and during this period, it may off-gas. Theoretically, spray foam insulation is "relatively inert" after this stage, but is it really? For one thing, there can be problems with installation. If the mix is not applied properly, toxic chemicals may remain present, off-gassing for an extended period of time and causing environmental illness such as respiratory diseases. For another, if the insulation is trimmed, drilled, or otherwise modified too soon, this can also cause the proliferation of toxins. These known issues indicate the teams installing spray foam installation during a home remodel or green home retrofit need to use extreme caution, and must be well-trained when it comes to working with these substances. In addition, some people appear to be getting sick from spray foam insulation even when it's applied and handled correctly during the hazardous stage. In extreme cases, homeowners have been forced to abandon projects or sell because their homes make them too ill. This would suggest both that certain individuals have a high sensitivity to polyurethane foam insulation, and that these chemicals may not be as safe as previously believed. There is a clear need for research and engineering to develop a safer product. There are alternatives to foam insulation known to be safer and environmentally friendly, who those who want to be green and healthy. 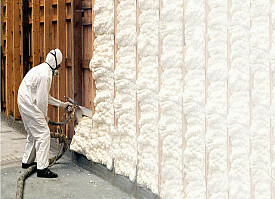 One option is mineral wool, a very old insulating material, and it's also possible to use cellulose or denim insulation. All of these products involve the use of recycled materials in their production, and they're inert, so they shouldn't cause health problems. It's possible that more biologically-based foam products will be developed someday, allowing people to enjoy the advantages of spray products without the risks. Are You Up On Your Radon Safety?